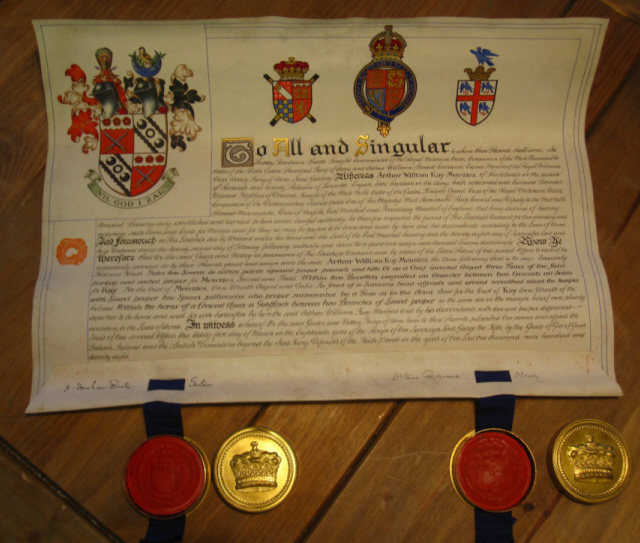 The 1928 Grant of Arms to Arthur William Kay-Menzies has recently sold on eBay for £164, vendor swan1011. Arthur William Kay-Menzies, born 1874 died 1944. Arms: Quarterly 1st & 4th Gules two swords in saltire points upward proper pommels and hilts Or on a chief invected Argent three roses of the field barbed and seeded proper (for Menzies) 2nd & 3rd [Argent] Within two bendlets engrailed an annulet between two crescents Sable (for Kay). 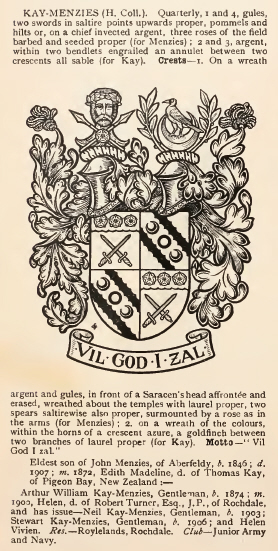 Crest: In front of a Saracen’s head affronte and erased wreathed about the temples with laurel proper two spears saltirewise also proper surmounted by a rose as in the Arms (for Menzies) Within the horns of a crescent Azure a goldfinch between two branches of laurel proper (for Kay).